During the course of her career, Jennifer Hayes has experienced numerous honours, including singing for the FIFA 2015 Women’s World Cup Soccer, and 2010 Winter Olympics and Paralympic Games, as well as performing alongside numerous celebrities such as Jim Byrnes, Michael Kaeshammer, Bria Skonberg, among others. She has performed throughout the world at various festivals and events in China, the USA and Canada (including the Vancouver International Jazz Festival and Harmony Arts Festival). Jennifer has enjoyed the privilege to sing with the Dal Richards Orchestra for over half her career. 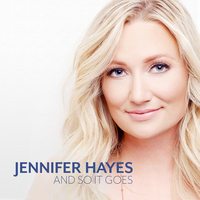 Jennifer’s new studio album, And So It Goes, was released worldwide on November 10, 2016 with a follow up video from the title track released in January, 2017. Through her music Jennifer aspires to emotionally connect with her audience. Jennifer holds certificates in piano from the Royal Conservatory of Music, and has also earned a Diploma in Commercial Music and a Bachelors Degree in Jazz Studies from Capilano University.